At E3, I lost my phone's Jawbone headset. 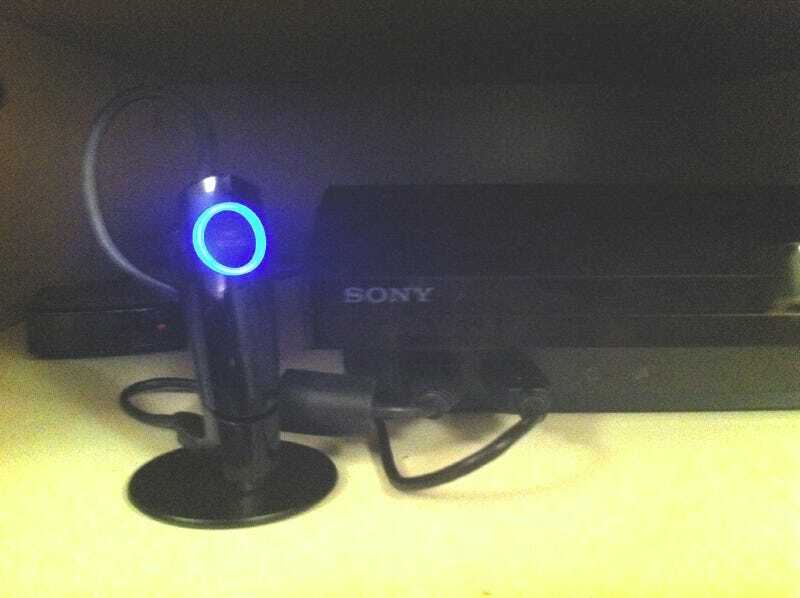 For multiplayer on my PS3, I've used a bulky, cheap, wired set that looks like I stole it from Mike Ditka. In either case, anything would be an improvement. What's in the box: Headset, USB cradle, instructions. Killing two birds with one stone in a one-half-ounce package is the new Bluetooth PS3 Wireless Headset, which makes a bid for smartphone cred by including the ability to pair it with a phone. Does it serve both purposes equally? One better than the other? Or one to the exclusion of the other? Sony Computer Entertainment America follows up its first official Bluetooth headset with a new design. A sleeker, lighter-on-the-ear unit with a smaller clip, the headset supplies plenty of volume and, when in use with the PS3, a high quality audio mode is there by default (you may disable it if you prefer) to keep you from repeating yourself to your teammates. Used with a phone, it touts noise canceling technology for clarity of communication and, for some, hands-free controls beyond volume and muting control. Pairing the Bluetooth PS3 Wireless Headset with your PS3 is, the instructions say, as simple as inserting it into the cradle and then the cradle into your console. While that was not the case with me, pairing it was still a two-step breeze through my system settings. Pairing the device with a smartphone works per the usual procedure there — set the phone to discoverable, then hold the headset's power button until its ring light indicates it's in pairing mode. Enter the four-digit code, and you're on your way. Swapping between PS3 and phone will require a hard disconnect. Fortunately, it's not one that takes too long. If your PS3 is on and you power on the headset, it will connect to the PS3 automatically. If your PS3 is off and you power on your headset, it will go into a discoverable mode, at which point you must press and hold the phone button (on the top of the device, forward of volume control) to tell it to pair with your phone. What if your PS3 is on and you want to make a phone call? Power off the device, then power it back on, and you will have a window of time to press and hold that phone button before it auto-connects to the PS3. To disconnect it from the phone and use it with the PS3, just power it off and then on again. For some phones — my iPhone 4 was one — holding the phone button while it's already paired with the phone will cue its voice control, if you have that feature. I was pleasantly surprised by how well it worked — something I credited to the device's noise cancellation technology. Volume up and down is self explanatory, ditto the mic muting (just touch that button) - the difference is this unit does not sound a tone every 20 or so seconds to remind you the mic is off, as the old headset did. The light flashes to indicate the mike is off, but of course you can't see that. There is an X'd out mic icon in your PS3 window that will come up if you press the volume up or down button and want to be sure. Visually, the design is very appealing, more modern than its bulkier older sibling. This isn't just another pretty design piece: audio quality is very strong. Clarity will depend somewhat on the in-coming communications, of course — some people are using crappy microphones after all. But assuming you get good input, you'll hear everything. In Madden NFL 11 I heard a guy mumbling to himself in his playcalling window as if he were next to me. When others were told I was testing a headset I was routinely complimented on the volume and clarity it supplied to them. The case advertises noise cancellation and I've no reason to doubt it delivered. Headset-only audio coming from the game itself — Madden's Gameflow coach commentary, for example — was crystal clear. Madden's headset game audio, curiously, had a habit of cutting out with the volume maxed. But backing it down one tick still supplied enough sound with no interruption. Swapping the headset between devices is an absolute breeze, and a quantum leap ahead of nightmares I've had in the past trying to another pair of Bluetooth headphones with more than one device. Even for the limitations presented by Bluetooth pairing, they nailed the execution. I can activate, pair, power off and switch my headset without removing it from my ear. Update: Reader Sean K. writes to say that you can't pair the device to the PS3 through the cradle. You must remove it from the cradle and then attach the USB cord to its socket at the front, then plug that into the PS3. The instructions don't make that clear. The device will not operate if it's inserted into the cradle. Only minor ergonomic points. If there's any aspect of the design that says this is primarily for console use, it's in the power cradle, which comes with the same extremely short DualShock 3 USB cable. What's more, it is impossible to detach using one hand. If your phone's ringing, you can't reach for it while unplugging the headset and jamming it into your ear. It takes two hands to free. The clip sacrifices some snugness of fit for less bulk and because it has a tendency to slide, takes a little practice before you can put it on one-handed. None of these quibbles are at all disqualifying. If not for the fact this automatically pairs first to your console, and not your phone, the PS3 Wireless Headset would be indistinguishable from a high quality smartphone headset. As a multiplayer headset, it's absolutely top-flight. It's a question of your multiplayer gaming style; some prefer a bulky over-the-ear headset that delivers both chat and booming game audio. For those who just want crystal-clear multiplayer audio with hassle-free operability, this is the way to go. And for those also looking to upgrade or replace a mobile phone headset, the purchase, at $49.99, is even more justifiable. PS3 Wireless Headset was manufactured by Sony Computer Entertainment for use with the PlayStation 3. Retails for $49.99. A device was given to us by the manufacturer for reviewing purposes. Tested the unit's audio in Madden NFL 11 multiplayer on the PlayStation 3 and with an iPhone 4 .